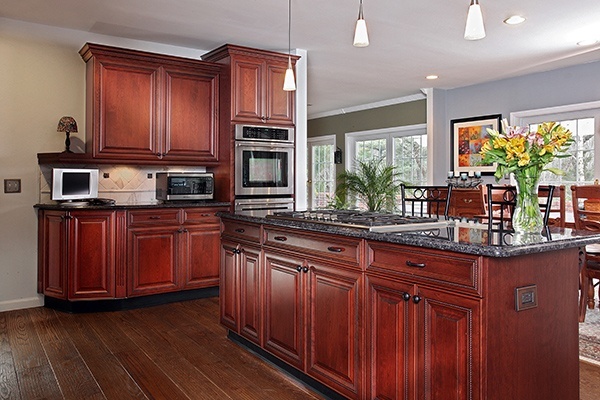 What Paint Colors Look Best With Cherry Cabinets? Often, we forget how much of an impact the color of our walls truly makes on the rest of the room. Sometimes, simply changing the paint color in your kitchen can change the whole feel of the space by making it appear larger or cozier. Whether you’re planning a kitchen remodel, or just looking to spruce up your kitchen with a fresh coat of paint on the walls, you’re probably contemplating your overall kitchen color scheme and wondering which colors to use. With cherry cabinets, you are automatically working with a strong element of warmth, from within the natural tones of the cherry wood. The next step in finding the best color to paint the walls is to decide whether you want to contrast or coordinate with the cabinets. When picking paint colors to pair with your cherry cabinets, you can go two ways: contrasting colors or coordinating colors. Contrasting will make both the cabinet and wall-color more predominant. On the other hand, coordinating colors will soften the impact of intense color-tones. Cherry cabinets can very in tone, depending on the type of cherry species, stain, finishes, and glaze that may be applied to the exterior. Depending on the depth of color in your cherry cabinets, you'll want to go with a color according to the following simple guidelines. Contrasting colors are colors that are opposite one another on the color wheel. They actually complement each other because they appear cleaner and brighter than simple neutral colors when it comes to paint. The contrast of the paint on the wall with your cabinets will make the cabinets pop and give some depth to your kitchen. 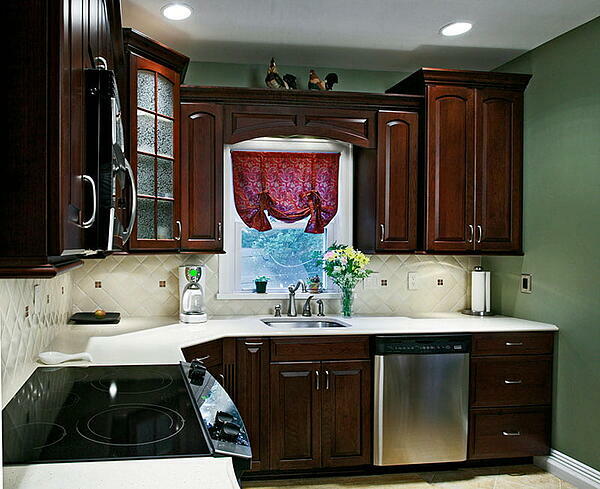 If you’re looking for paint colors that contrast with cherry colored cabinets, green is the color choice for you. The shade of green that you choose all depends on the shade of your Cherry cabinets. With darker cherries, you'll want to stick to lighter shades of green, like sage or thyme. With lighter colored cherry cabinets, like our Classic Cherry finish, you can can get away with painting your walls a darker green to highlight the lighter, natural color of the cabinets. For the lighter cherries, try a true green or a forest green. Blue is also an option for you, if green just isn't your cup of tea. The same color principles would apply; consider muted blues for lighter shades of cherry, and brighter or bolder blues for darker cherry cabinets. Coordinating colors are all about harmonizing with elements inside your kitchen to enhance the natural colors in the space. The best way to pick a coordinating paint color for your kitchen is to pick it right out of an existing element in your kitchen, like a fleck of variant in the countertop, or a shade present inside your backsplash. When picking these features, don’t go for a color that’s metallic, too bold or too dark—these can compete with the colors you already have in your kitchen, and can make your space appear inconsistent or smaller than it really is. Great coordinating neutrals for cherry cabinets are light grays, taupe or pale beiges. 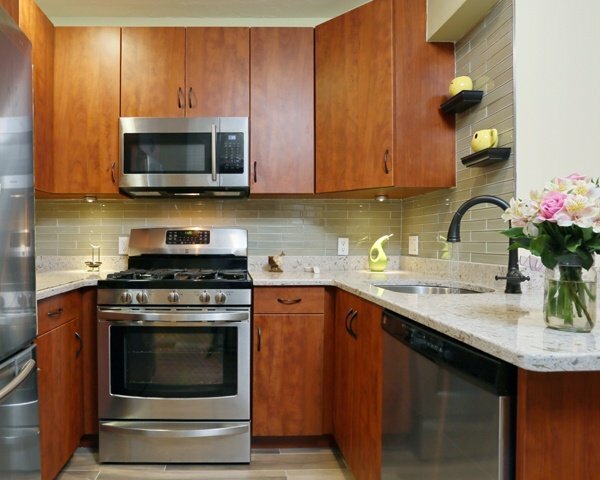 Need help visualizing your kitchen's colors and design? Our expert design consultants can help. When you're ready to get started with your kitchen project, schedule a free in-home consultation at your convenience, and get a same-day price quote. 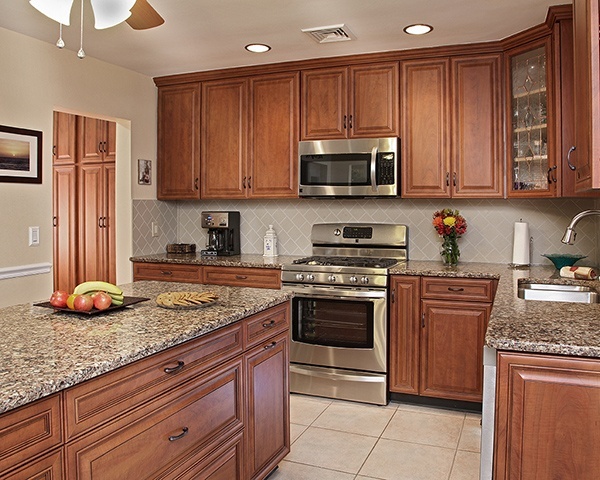 What Countertop Color Looks Best with Cherry Cabinets?